Property that was once a de-facto dump, and is now unimproved Errol Heights Park, is now even closer to fulfilling the Master Plan accepted by Portland Parks & Recreation (PP&R). The park property stretches between S.E. 45th and 52nd Avenues, in the Brentwood-Darlington neighborhood. At the sixth meeting of the Errol Heights Park's Community Advisory Committee (CAC), held on November 14 at Sellwood's SMILE Station, and at an open house at Lane Middle School on December 1, both the CAC and community reviewed the "final park design concept", and provided feedback to the design team. Nearly half of the 34 people at the CAC meeting were neighbors interested in the park's development. "We're starting to 'dial in' the project, as it is coming together; we've moved from presenting schematics of options, to drawings – which give both CAC members and neighbors community more meaningful information on which to comment," remarked PP&R Landscape Architect/ Project Manager George Lozovoy, before the CAC meeting got underway. Among those attending the meeting was neighbor Gail Erickson, who said she lives at the edge of the park. 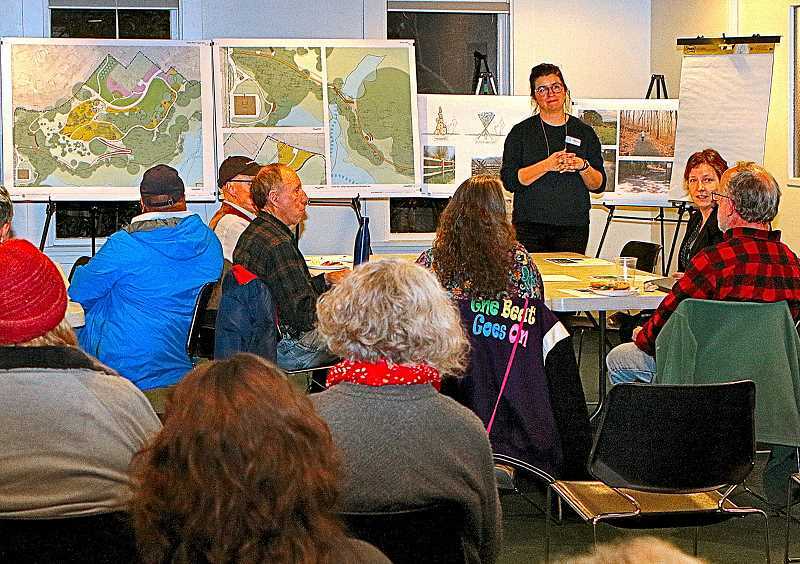 "Because I, and several of my neighbors, would like to see it developed in a 'quiet' way, I am happy that they took out the idea for soccer fields," she said. About the process of developing the park, Erickson commented, "I feel that neighbors' comments and concerns have actually been heard – including keeping the [community] garden in its present location, keeping some of the natural spaces, and seeing that it's more usable, but not over-utilized." Gail Kiely, alternate Brentwood-Darlington Neighborhood Association liaison to the CAC, and also a member of the park's Master Plan Committee, said she found it of interest that the "peewee soccer field" had been eliminated. "This feature was one of the main reasons the Park's Master Plan was approved in 2005. And, while I agree our neighborhood needs a 'skate spot', this isn't the place; it would be better located in Brentwood Park or Harney Park – they're both approved for skate parks." During the public comments, a neighbor asked about when S.E. Tenino Court is closed to traffic for the park, if emergency vehicles will still have access – and was assured by Lozovoy that they would indeed be able to come into the park when needed. Due to existing the Water Bureau facilities in the right-of-way, this section of S.E. Tenino Court cannot be vacated, Lozovoy said. "PBOT is using the 'Portland in the Streets Program' to permit the closure; PP&R is currently collecting signatures confirming that people have been informed of the closure." Those at the meeting learned that two "Portland Loo" public restrooms will be part of the park's new amenities, but will be closed from midnight until 5 a.m. every day. With neighbor concerns about transients camping in the park, especially near the covered picnic shelters and areas, PP&R's approach is to make visibility and openness a goal to promote safety and discourage destructive behavior. Project consultant Ryan Carlson of Mayer/Reed, Inc., showed – using illustrations – where a "spine trail" is planned to run along the upper part of the park, to be used by bicycles and pedestrians. Further, Carlson remarked that an ADA trail will loop through the park, to provide an accessible way to explore it; additional trails will be connected to the ADA trail to connect park users to the woodland, and other experiences around the park. Asked about the time-line of this project, Lozovoy told THE BEE, "The biggest hurdle will be Land Use Planning for the natural area; because it is an Environmental Zone, the area is delineated as a wetland. It will take some time to redo the wetland designation, working with the Oregon Department of State Lands and the US Army Corps of Engineers to obtain permits to do some of the trail improvements in that area." The project is expected to be sent out for construction bids in the spring of 2020, Lozovoy said – adding, "so it's a ways off."